Looking for a place with your leisurely holiday? 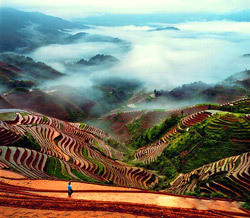 Right here, Guilin & Yangshuo, escape from the bustle city, the picturesque Karst mountains, clear rivers, charming countryside scenery surrounding by rice paddies as a Chinese landscape painting, it must be great attractions waiting for you. Guilin Yangshuo China's Natural Wonderland Yangshuo is located in Guangxi province in the South of China, approximately 65Kms from Guilin. Yangshuo and the surrounding countryside are incredibly picturesque. The landscape is filled with steep small mountain peaks and the Li River winds its way around them. Yangshuo is an extremely laid back small village town with excellent facilities for both domestic and foreign visitors, a perfect place for a break from the major busy cities. Yangshuo has a wide range of hotels catering for everyone. From the small guesthouse to 5 star hotels and everything in betweenYangshuo is also a travelerâ€™s paradise when it comes to dinning out. There are many restaurants serving both Chinese and western foods. Many of these western restaurants are run by foreigners, together with many local ethnic groups, they are making Yangshuo a beautifully relaxing multicultural place. After breakfast , taxi take you to Guilin pier catch at big boat down to Yangshuo, it takes about 4.5 hours on Li river cruise, after arrive Yangshuo walk to Magnolia hotel. 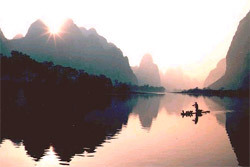 Evening see Impression Show on Li river. Taxi take around the most beautiful country side of Yangshuo, you will see many rice fields, villages, Moon hill and Dragon river, lunch in old village's traditional farmer's home, after lunch taxi drive you to Silver cave, (a most beautiful cave in this area), then taxi take you from another road back to Yangshuo. evening see cormorant fishing on Li river with a fisherman. After breakfast, taxi take you to Baisha town see traditional farmer's market, then taxi take you to Old Dragonn bridge take a bamboo raft from there all the way down to Xiatang village, it takes about 2 hours on bamboo raft, you will see many of Karst hills's reflection in the water, very beautiful, then taxi pick up back to hotel. free night. After breakfast taxi send you back to Guilin airport and say goodbye. Our guide will pick you up at Guilin Airport and transfer you to 5star hotel in Guilin, the rest of the day is on your own to explore the metropolitan city of Guilin. Depart from your hotel in the morning and transfer to the Zhujiang Pier for a Li River Cruise, a 4-5 hours wonderful down stream cruise to Yangshuo, with lunch on the boat. You can soak in the scenes of picturesque mountains, peaceful green rice fields, farms and villages with water buffalos, other animals and birds wondering around on both sides of the river banks. You get off at the central old town of Yangshuo in the afternoon. You will be transferred 4-5 stars hotel nearby. Enjoy the West Street shopping the whole afternoon and get ready for the traditional light show (Liu Shan Jie) at night at the Li River bank. After breakfast we will take an electric cart tour right in the countryside ride, passing through some villages, looking at some rafting and bamboo boat on the Yulong river and we can also visit the famous Moon hill, climbing to the top to enjoy an amazing view of rural china. Lunch at a well set up restaurant along the track. Dinner at a down town restaurant. 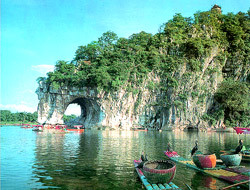 Check out the hotel in Yangshuo, take a private coach to the Silver Cave and two ancient bridges, traveling back to Guilin to have lunch, visit some famous Guilin tourist spots while on route to the airport. Say good bye.